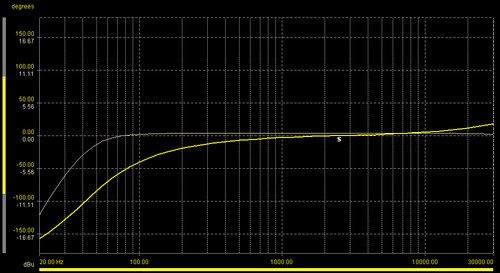 For a basic introduction to phase and polarity, read this useful blog entry from our friends at Universal Audio. At this stage it is worth noting that phase and polarity are not the same thing. 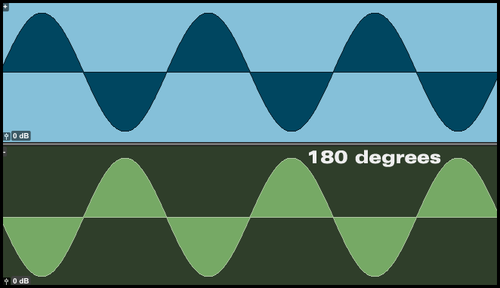 Typically, 180 degree polarity reverse functions provide a means to ‘flip’ the entire waveform upside down - positive becomes negative and vice versa. This is often a useful but slightly crude method of obtaining better coherency when combining two signals that are ‘out of phase’ with one another (think top and bottom snare microphone). However it is most likely that any two sources will be ‘out of phase’ in a particular frequency range and often not by 180 degrees. Therefore the polarity reverse function is often a compromise - one which is ultimately won by the position that provides the most pleasing or positive low frequency summation. Phase angle is a term used to decribe the location of a point somewhere along the cycle of a waveform as measured from it’s origin. More simply, if a wave starts at zero and rotates (simple harmonic motion) from 0 to 360 degrees, it will have completed 1 cycle (or 1 wavelength) and any point along this cycle (wavelength) can be described in terms of angle (degrees). It can be seen in simplistic form here. 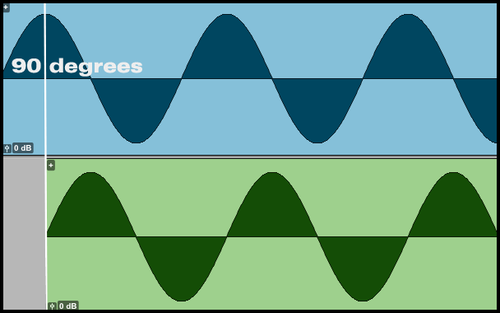 It may be apparent that depending upon the frequency of your signal (and thus wavelength or period, T = 1/f) that 90 degrees at 100 Hz is much larger in time (or distance) than 90 degrees at 1 kHz. 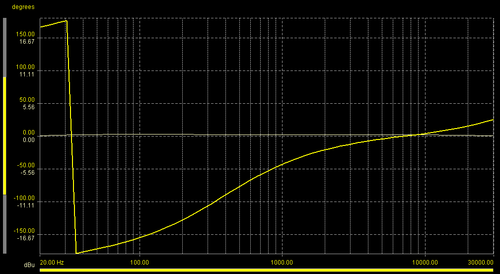 As frequencies increase, phase angles occupy smaller amounts of distance or time. For this reason, phase shift networks can be used to provide frequency specific rotation to correct for phase summation issues - these are often seen in loudspeaker crossover designs. You can use a time alignment process to ensure that two signals impact at the same time and have strong phase coherency when they are capturing the same source (such as the isolated guitar cabinet in Oz’s technique). However time alignment is tricky to do when adjusting multiple microphones on a source with large acoustic surface area such as a drum kit (afterall drum kits are not a point source). Likewise in several situations, placing microphones at different distances from the source will provide large variations in creative ambience (pre-delay / early reflection content in room mics on drums or guitar amps etc) and this is likely something you want to retain. It is also popular to track electric bass with both a direct and amp feed. 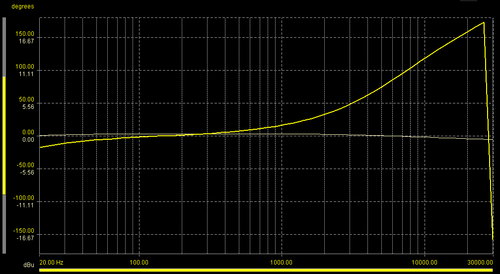 The D.I will always be a little earlier in time compared to the amp > speaker > air > microphone > preamp chain. This can easily be rectified in the DAW by nudging the D.I track in time with the amp… however if you work on tape (heaven forbid!) 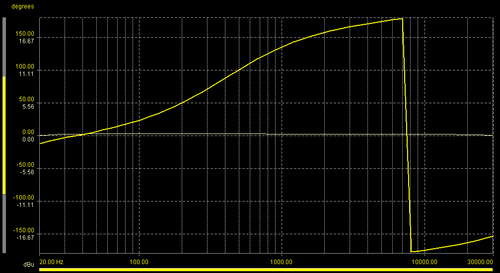 or want to monitor the corrected tone in real time whilst tracking this is harder to achieve. One crucial thing to remember - time-alignment provides the same delay at all frequencies, phase shift networks can provide frequency specific delay. Once you have experimented with traditional 180 degree polarity reversal and time alignment methods, you may start to look towards the implementation of all-pass filters to provide displacement in time without affecting amplitude response. Our Audient MiCO preamplifier and AD-converter features a vari-phase control allowing you to align two signals easily (the other channel has HMX harmonic enhancement for more tonal options - blog entry coming soon!). The MiCO vari-phase control provides continuous adjustment of phase rotation between 0-180 and 180-360 degrees when used in conjuction with the polarity reverse function. This tool can be used in real-time (with a tape machine) and can be used to correct problems or creative effect. For a good explanation of all-pass filters used as phase rotators, please take a look at this nice blog from Dave Berners at Universal Audio. 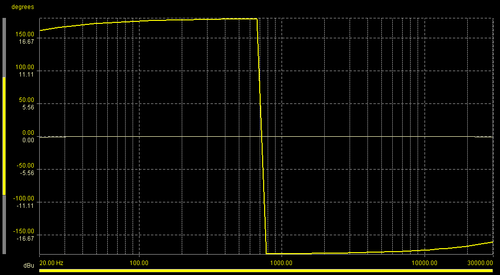 To make it easier to understand, I hooked up a MiCO to our Prism dScope and measured the phase and frequency response. 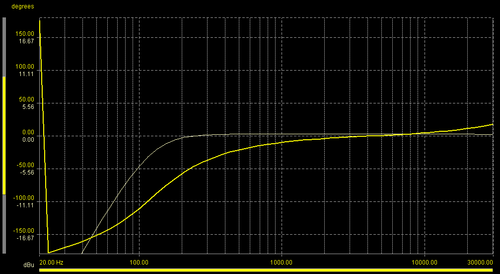 Below is a phase vs frequency (yellow) and amplitude vs frequency (white) measurement of a MiCO channel set flat (all functions bypassed). 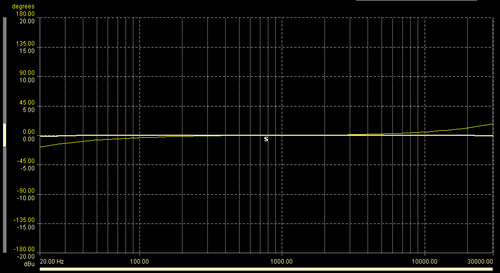 Note that the amplitude response of the MiCO is ruler flat with only a slight deviation of the phase response. If we engage the 180 degree polarity flip function you will observe a complete reversal of signal polarity as indicated by the +180 and -180 y-axis readings. 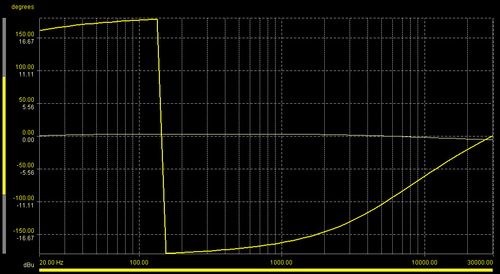 Note that the amplitude frequency response remains the same as this type of function just changes the differential direction of the signal and has no effect on the frequency domain. 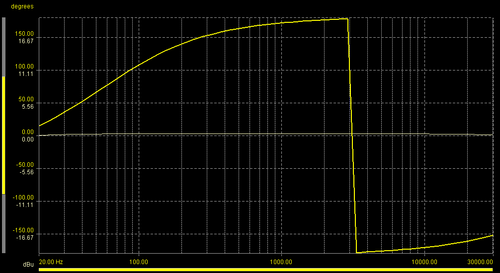 It is worth noting that anytime you change the frequency response, you change the phase response. 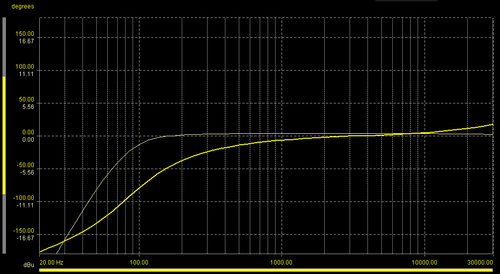 Observe the amount of phase-shift added when engaging the HPF option on the microphone amplifier. 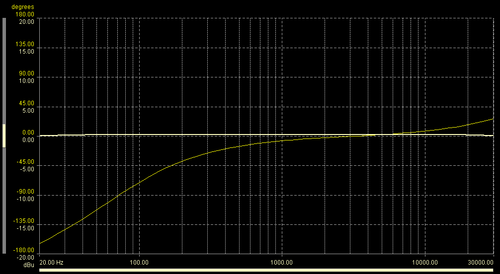 Note that this is true for any analogue equaliser or filter! 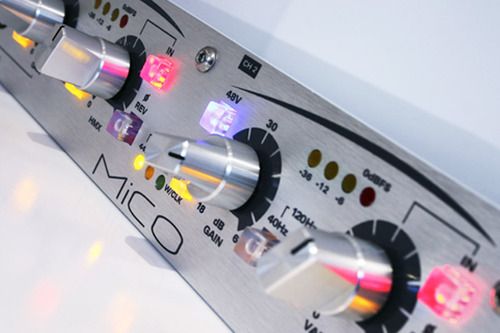 By engaging the vari-phase all-pass filters, MiCO can place the phase rotation where it is needed and cover all of the adjustment to be surgical or creative whilst maintaining a flat frequency response. Clearly the vari-phase circuit provides much more control over aligning phase content compared to simple polarity reversal functions. There are some trade-offs in transient response but all-pass filters are very useful circuits! Pretty cool.